'When Captain America throws his mighty shield, all those who chose to oppose his shield must yield...' After the release of the Diamond comic stats for November, I cant help but think someone is singing that old theme tune in the halls of Marvel at this very moment. In October DC had narrowed the gap to about 3%, and locked Marvel out of the Top 6. One month later Captain America: Reborn #4 steals third base, and the sales gap opens back up to over 7%. Despite the other five spots belonging to DC (four of which tie to mega-event Blackest Night), Marvel still managed to emerge as publisher numero uno with 41.93% market share and 37.85% dollar share, compared to the 'Distinguished Competitions' 34.78% unit share and 31.71% cut of dollar share. 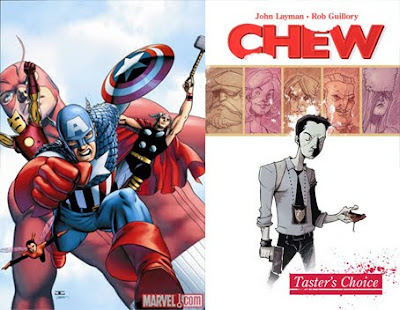 THE WINNER ON THE NIGHT: The 'Big Two' aren't the main course on the Top 10 Trade Paperbacks list- their top seller is the first TPB of Chew from Image. For just $9.99 readers looking for something quirky and different, can catch up on the detective who eats at the crime scene (and the odd body) in order to get a few psychic impressions to help himself figure out whodunit, and why.